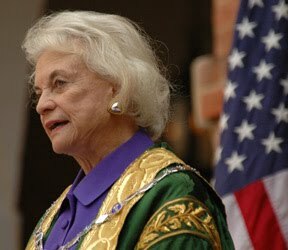 ... 2006 (5 years ago today), Sandra Day O'Connor completed her last day as a Justice of the U.S. Supreme Court, nearly a quarter-century after she'd become the 1st woman to hold that position. It'd be an overstatement to say that O'Connor (right) "retired," however, for the former Justice has remained active. (photo credit) Among other things, she's: written the Senate to support CEDAW, the Convention on the Elimination of All Forms of Discrimination Against Women that the United States has signed but not ratified; campaigned for an end to the election of state judges; served on a task force on the International Criminal Court convened by the American Society of International Law; and interviewed Justice John Paul Stevens, her just-retired colleague, for Newsweek.